The Office of Substitute Decision Maker (OSDM), now known as the Office of Public Guardia (OPG), utilizing an assistant attorney general, has filed action against Roy Kotval in the previous GCPR011464 case, to deny Roy from visitation with Advocate Jay Driesen and associate. The hearing will be held telephonically apart from any input from Jay Driesen and associate even though Roy is the Trust Maker of his Trust, and Jay Diesen and associate are Trustees. They will be attempting to separate Roy Kotval from his only two visitors that interact and visit with him. It does not appear that Roy will be able to testify himself as an attorney has been appointed who previously served him, but did not set forth all the initial due process rights violations. We have IA Code 235F on Elder Abuse and Financial Exploitation, but which the courts are conveniently ignoring for the most part. October 11, 2016 (early in the day) Roy given ticket by Canton, SD police for driving while his license was suspended. Roy is transported to Inwood-Canton hospital. Lyon County, IA deputy asked hospital to keep Roy on a mental health hold but hospital doctor refused. The deputy called Roy’s friend about safe place to keep Roy. The friend would check on Roy in the morning if the deputy could get Roy home. The deputy transports Roy to his residence and they go in together to show Roy how to call 911. Appears Roy may have stayed at his home that night. October 12, 2016 Canton Police call the deputy, Roy walking around “lost” with car battery. Canton, SD officer, Meinzer, brings Roy to Inwood, IA and meets the IA deputy who then takes Roy to Sheriff’s office. Deputy leaves Roy at Sheriff’s office and visits the county attorney what to do with Roy. attempting to find a place for him. Roy is brought to the Rock Rapids, IA Sanford hospital. Admitted there for infection on leg. Deputy fills out commitment paperwork in case they can find placement for Roy. October 12,2016 Roy is transported by ambulance to Sioux Falls Sanford Health Center. October 18, 2016 Roy is in Sioux Falls Sanford Health Center. By this date the infection on his heel is cured. From that time on Roy demands to go home. He is held against his will until early November, 2016 when Roy is transferred to Sheldon Sanford Senior Center. Per 235B.19(7) DHS agent did not submitted a PETITION FOR EMERGENCY ORDER UNTIL Nov 9, 2016 when it should have been done by this date at the latest. However, Roy was not returned home due to this error. ­­­­­­­­­­­­­­­­­­­­­ On November 9, 2016 the social worker issues an Affidavit in Support of Petition for Emergency Order when an emergency ORDER should have been issued by 4:00 pm the next business day when this action started. IA 235B.19(7) Did not seek appointment of temporary guardian or conservator. November 9, 2016 Lyon County attorney files a PETITION FOR EMERGENCY ORDER IA 235B.19 based on Affidavit of social worker. November 9, 2016 Lyon County, IA judge orders protective medical services for Roy stating that there is no one to consent to such services for Roy. Roy is to be placed at Sanford Senior Care in Sheldon and in their lock down section This Order expired Nov 12, 2016 at 4:14 pm. Was not renewed at that time. Notice of social worker’s Affidavit, County Att Petition For Emergency Order and Order of county judge were not served on Roy until Jan 3, 2017 per records of O’Brien County Sheriff doing service to Roy. Roy, nor any representative, received any service until Jan 3, 2017 nor any attorney appointed for him. December 1, 2016 County attorney files Application for 14 Day Extension for an emergency order when the Order of the county judge of Nov 9, 2016 was already expired on Nov 12, 2016. December 01, 2016 ORDER FOR FOURTEEN DAY EXTENSION OF EMERGENCY ORDER by county judge. Also ordered that a copy of this order be served on Roy 5 days prior to the next scheduled hearing. Roy did not receive notice in time of any hearing to held. Roy received notice of this Order on Jan 3, 2017. Roy was not present at this hearing nor is it know if such hearing even took place. Early December, 2016 Jay and his associate meet with Sheldon Senior Care administrator and the social worker in Sheldon. Social worker claims Roy is against big governement. December 14, 2016 County judge ORDERS PROTECTIVE SERVICES IA 235B.19 and ORDER SETTING HEARING IA 235B.18 & 235B.19. A review hearing is set for February 10, 2017 at 9:30 am. All exhibits are sealed. IA 235B.18(3) states: ” The dependent adult shall receive at least five days’ notice of the hearing. The dependent adult has the right to be present and represented by counsel at the hearing.” O’Brien sheriff served nothing on Roy until Jan 3, 2017, which may have included this Order. December 14, 2016 A Sheldon Senior Center MD claims Roy suffers from Alzheimer’s dementia. Claims current medication working. Roy needs to stay in locked unit. Current meds are working for Roy. December 21, 2016, Jay met with the Lyon County deputy involved. December 23, 2016 the deputy contacts Inwood, IA and Canton, SD Post Offices to forward Roy’s mail to social worker. December 28, 2016 Deputy contacts Jay’s associate for financial documents of Roy as Roy had asked us to take care of his bills and other financial duties. Roy did so with the issuance of limited Powers of Attorneys specific to the task. December 28, 2016 County attorney petitions for emergency order and order enjoining Jay & his associate in conflict with IA 235F(b)(4) regarding good faith financial assistance at request of elder. Served on Roy Jan 3, 2017. December 29, 2016 County judge issues Order enjoining (prohibiting) our actions of Jay and associate and nullifying the POA’s. Roy may have been served this on Jan 3, 2017. A GAL (temporary guardian) was appointed over Roy. January 01, 2016 Jay files Affidavit for and Application for Guardianship. January 03, 2017 County attorney files STATE’S NOTICE OF EXHIBIT FILING AND REQUEST FOR CLARIFICATION on sealed exhibits. Uses Jay’s filing for limited guardianship and Affidavit from Roy as Exhibit. Attempt was made to not give Roy copies of filings as these sealed filings would get to Jay & associate. January 03, 2017 Doctor’s report (Exhibit 5) obtained from Rock Rapids Sanford that noted a chart on Roy from Canton, SD hospital where he was allowed to go home after observation of eating by himself and going to the bathroom without assistance. January 23, 2017 Hearing ordered for issues of enjoinment of Ray & Jay including appointment of permanent guardian/conservator. Rather 4 Sanford Senior Center medical witnesses were present along with testimony from the state to prove that Roy was incompetent. Jay & Ray had no advance notice of list of witnesses or exhibits to be presented and thus not prepared to cross examine these witnesses nor did we see the exhibits in advance, in our part defending on behalf of Roy. January 23, 2017 Report issued by temporary guardian – GAL. January 26, 2017 County attorney files a Petition under a new case number GCPRO11464 seeking involuntary appointment of a guardian and conservator from the IA Office of Substitute Decision Maker (part of the overall dept of Human Services and Office on Aging). State’s attorney claims limited guardianship is not appropriate and 3rd party assistance is not available knowing full well that Jay and associate had filed application for guardianship the first part of this month of Jan.
February 01, 2017 Jay & associate file Answer to Original Notice Filed January 26, 2017. A hand written section of Roy is signed and attached to said document. February 02, 2017 Jay & associate file their same Petition for Appointment of Appropriate Guardianship and Conservatorship under the new case number Supporting Affidavit from Roy is signed and attached. February 3, 2017 Jay’s associate files Notice of Objection to an Unlawful Order & Opportunity to Cure as Amended. Jay files 2nd Notice of Objection to an Unlawful Order and Opportunity to Cure the following day. February 06, 2017 ORDER issued giving appearance of declaring Roy incompetent, upholding injunction against Ray & Jay, declaring POA’s for Roy as enjoined for now, GAL request for reimbursement on hold, Roy’s motion to dismiss denied, GAL and appointed attorney continue in their role for now, and hearing on guardianship and conservatorship scheduled March 6 at 1:00 pm. February 14, 2017 Jay & Ray file MOTION FOR ENLARGEMENT AND DIFFERENT JUDGMENT SUBSTITUTED challenging most everything thus far. December 01, 2016 ORDER FOR FOURTEEN DAY EXTENSION OF EMERBENCY ORDER by county judge. Also ordered that a copy of this order be served on Roy 5 days prior to the next scheduled hearing. Roy did not receive notice in time of any hearing to held. Roy received notice of this Order on Jan 3, 2017. Roy was not present at this hearing nor is it know if such hearing even took place. Due to the magnitude of abuses heaped upon Roy Kotval in the two mentioned cases, the undersigned submit this MOTION TO DISMISS based on this aspect of written law regarding the denial of the Constitutional right of Due Process, in the matter of service that has been denied to Roy Kotval resulting in injury to his life, liberty, property and happiness, which denial necessitates dismissing any and all actions against Roy Kotval. Dismissal has been orally suggested in GCPR011446 and with standing written suggestion in GCPR011464 by Court appointed attorney Cosgrove, but without explanation or without any stated reason other than “dismiss this action”. 1) On October 12, 2016, Roy Kotval (Roy) was placed in protective custody under IA 235B.19 claiming he was a danger to himself and others, and emergency services were initiated on his person, along with a private and unproven claim Roy was a “dependent adult” because he was the recipient of services that he had not requested nor agreed to pay for. 2) The EMERGENCY ORDER AUTHORIZING PROTECTIVE MEDICAL SERVICES UNDER IOWA CODE SECTION 235B.19. filed on November 9, 2016 was the first filing in the Roy Kotval matter , GCPR011446, that made attempt at authorizing 28 days worth of services for Roy Kotval, all the while holding him against his will, after Roy’s apprehension on October 12, 2016. 3) From the EDMS record on GCPR011446 service was first made on Roy in this case number and matter on January 4, 2017 at the Sheldon Senior Center by the O’Brien County Sheriff’s Office that shows a Return of Service on January 5, 2017 which states that a copy of STATES NOTICE OF EXHIBIT FILING was served on Roy. Such is not an Original Notice of Service. 4) In fact the record clearly shows that Roy never did receive any Notice of Personal Service himself in this case, nor did anyone that might defend his rights receive Notice of Service even though the rights to Roy’s person, liberty and property were substantially reduced and impaired while being inflicted with injuries by the actions in GCPR011446. As this government entity did not follow the fair procedures of due process in this particular instance before arbitrarily denying and injuring Roy’s life, liberty and property, in violation of DUE PROCESS against Roy, any and all actions in the Matter of Roy Kotval, so initiated by this first action, must be dismissed, control of Roy’s funds returned, his freedom and right to self governance restored, and termination of any and all attempts to abuse, harass, intimidate molest, interfere with or menace our vulnerable and beloved elder, Roy Kotval. 1) The action in GCPR11464 begins on January 26, 2017 with the filing of a PETITION FOR APPOINTMENT OF GUARDIAN, filed by Shayne Mayer, Lyon County Attorney. 2) Personal Service is purported to have been made to Roy Kotval at the Sheldon Sanford Senior Center on February 08, 2017 by the O’Brien County Sheriff’s Office. Attached to the Return of Service is a copy of the ORIGINAL NOTICE incorporated in the caption of: RE PETITION FOR APPOINTMENT OF GUARDIAN CONSERVATOR (INVOLUNTARY). Although this form includes a section for the signature of the clerk of court and seal thereof; 1) the clerks signature is lacking, 2) and the clerks seal is missing. See Exhibit A attached hereto. 633.568 Notice to proposed ward. 1. a. If the proposed ward is an adult, notice of the filing of the petition shall be served upon the proposed ward in the manner of an original notice and the content of the notice is governed by the rules of civil procedure governing original notice. IRCP 1.302(2) The original notice shall be signed by the clerk and be under the seal of the court. For the above reasons, this service is deficient and not perfected, therefore all continuing actions and injury against Roy Kotval, his person, his liberty, his property and his happiness must cease and Roy released from custody, as required by written law. 1) As we have stated, the actions against Roy Kotval were initiated on October 12, 2016 when officer Michael Meinzer from Canton, SD police delivered Roy to Inwood, IA where Lyon County deputy, Amy Stoner initiated and assumed protective custody of Roy Kotval, taking him to the Lyon County Sheriff’s office and then to the Sanford Rock Rapids hospital. Later Roy Kotval was transferred to Sioux Falls Sanford Health Center, via ambulance at his own expense. 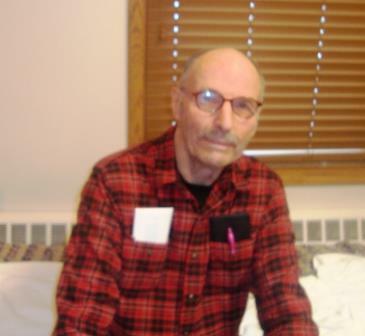 On or about November 9, 2016, Roy was transferred to the Sheldon Senior Center and placed under lock and key, where he remains incarcerated against his will and to his injury to this day. 2) In addition to no Personal Service being made on Roy Kotval in this case, an Emergency Protective Order was not in the hands of anyone by 4:00 pm on October 13, 2016 or even shortly thereafter. Again, any and all actions and injuries inflicted against Roy Kotval must cease and be completely dismissed. Under rule of law, this court has no subject matter jurisdiction and cannot acquire jurisdiction after the fact or matter. Respectfully submitted on this 20 th day of March in the year of our Lord 2017. The undersigned hereby certifies that this instrument was served via EDMS on the 20 th of March, 2016 to the listed parties. We left off in our previous report about the trials heaped upon Roy Kotval early this year, and where the state guardian was appointed to care for him per Order of the District Court issued April 12th, 2017. The request for guardianship by Jay Driesen and Raymond Ehrman, which was preferred by Roy, was denied. The Office of Substitute Decision Maker (OSDM) which is part of the Iowa Department on Aging was set by the court as guardian and conservator for Roy. We believe this action to be a violation of the IA 231E.2 and .4 series that gives preference to volunteers, family members and friends. The District Court ignored this request based on the fact the court believed Roy needed locked up memory care, due to observed loss of some short term memory, versus care administered by friends and volunteers, Driesen and Ehrman, wherein we would have placed no more restrictive means against Roy’s life, liberty and happiness than absolutely necessary. Driesen and Ehrman believe a vulnerable elder must be challenged to do what they possibly can even with assistance provided. More dramatic measures can be taken only when necessary. Even though the trustees of Beloit Acres Uninc (the properties of Roy Kotval) made known to the court in February, 2017 that this property had been placed in a duly recorded trust, the OSDM made attempt to ban the trustees from this property and had someone come out to Beloit, IA and place two locks on the property after OSDM had received their new authority on April 12th. Using members of the Lyon County Sheriff’s office, the OSDM proceeded to warn the trustees that they would be arrested if the trustees entered the trust property for any reason. Such threats to cease and desist were also mailed to the trustees….all done without any Order or Ruling from the District Court. The trustees warned law enforcement and the OSDM that they themselves could be held accountable as they did not have control of the trust property in question. Shortly thereafter an attorney from the Iowa Attorney General’s Office filed a Request For Clarification seeking right to the property. In June, the court answered concerning other cleanup matters but was silent on the property issue. The trustee’s removed the locks and proceeded with cleanup and maintenance on the properties. On March 6, trustees, Ehrman and Driesen grouped the violations together and filed an Elder Abuse claim under a new law passed in Iowa during the 2014 session known as The Elder Abuse and Financial Exploitation act found in IA Code 235F which allows and provides for substitute petitioners which are lay people representing someone over 60 yrs of age who have been abused and/or financially exploited. On March 20, the District Court issued an Order claiming: “This action amounts to an impermissible collateral attack on the February 6, 2017 Order of the Lyon County District Court.” The Order amounted to a claim that the issues of denial of due process and rights of life liberty and property along with happiness were litigated in the February 6 Order. Truth is these issues were partly and vaguely acknowledged and briefly referred to by the District Court which is no litigation on the matter at hand. In fact the District Court would not even allow testimony in all the hearings regarding Roy’s rights deprivations, nor would the district court deal with or refer to or even mention the specific law violations that occurred in the actions against Roy that started on October 12, 2016. On April, 01, 2017 Driesen and Ehrman filed a Motion to Enlarge on the District Courts March 20 Order, wherein among other issues argued, Driesen and Ehrman contend that state parties can be held accountable under the new IA Code 235F Elder Abuse & Financial Exploitation law when basic constitutional rights and dramatic violations of the IA Adult Protective Codes (235B.19) are violated. On April 21, 2017, the District Court issued an Order that was to address the Motion of Driesen and Ehrman to Enlarge by issuing three sentences with this conclusion: “The Court has reviewed the same and concludes that the reasons for dismissal of this action have not changed nor is the court persuaded that its original determination to dismiss this matter for the reasons stated should be revisited.” Failure to address the issues does not equal due process under the law. On April 25, Driesen and Ehrman filed a Notice of Appeal on this dismissal with Roy’s blessing. The Lyon County attorney is represented by an outside attorney with the other state parties being represented by the Iowa Attorney General. On September 22, 2017 a Final Reply Brief was filed by Appellant’s/Plaintiff’s, Driesen and Ehrman, as petitioners for Roy Kotval. Roy also signed the documents. The contentions of the petitioners/trustees were and are: 1) Can state parties, as defendants, continue applying adult protective services in violation of IA Code 235B.19(6)&(7) when the prescribed, proper emergency protective orders are not followed and updated per the mandates of these sections? 2) If the prerequisites for the emergency protective orders are so violated, can excuse be fabricated from the bench to prevent the cessation of dependent adult services? 3) Can the violations of dependent adult services, levied against the vulnerable elders of our state be allowed to decimate the due process and civil rights of our vulnerable elders? 4) Can the decimation of these civil rights against our vulnerable elders be heard under Iowa’s new Elder Abuse and Financial Exploitation law in 235F? 5) Can state parties be held accountable for these blatant rights denials action, under the 5th and 14th Amendments and Art 1, Sec 10 of the U.S. Constitution and IA Constitution Art.1, Sec 9 and 21? Are the requirements of IA 235B.19(6)&(7) supported by the 5th, 14th Amendments to the U.S. Constitution and the IA Constitution Art 1, Sec 9? In other words, even though IA Code 235F is still very new and untested in many ways, this appeal is a request to be heard on these stated issues somewhere and somehow and that quickly as Roy has been behind lock and key for over one year now. Additionally a court appointed attorney filed an appeal for Roy regarding the appointment of the state as guardian for him. Driesen and Ehrman were not allowed in this action. Roy has not been receiving any of the filings in this matter, nor are they available. Presently Roy enjoys visitors, but the only ones visiting him are Driesen and Ehrman. We are sure Roy would enjoy additional concerned visitors. Roy has no working phone provided to him by the Sheldon Senior Center in violation of the Nursing Home Reformed Act of 1987.